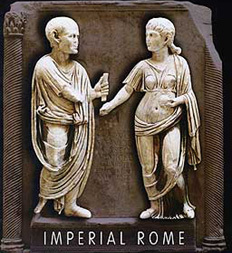 Imperial Rome explored the magnificence of Rome during its reign as the dominant political, economic and military power of the western civilized world. The exhibition took a glimpse into life during the Roman Empire from 27 BC to the middle of the third century AD showcasing objects related to elaborate banquets, Roman baths, religious beliefs, public ceremonies, successful trade systems and powerful emperors. Although Rome began as a small village of huts near the banks of the Tiber River in the eighth century BC, by the middle of the third century AD, Rome was the dominant political, economic and military power of the western civilized world.